I’m calling time on this blog. Time to say goodbye to Don’t Wake The Baby. I’ve really enjoyed writing about my baby daze. However I’m increasingly struggling to find the time and motivation. One of my main reasons for blogging was to keep a record of my little ones early years and I have done that. I’m so pleased I have this to look back on, especially my two birth stories. I also wanted to share my experience and help others who might be despairing at their inability to get a good night’s sleep. But now my boys are older I reflect that this is a little futile. Every child is different so there can be no ‘good’ or ‘bad’ approaches. Maybe it took having a second baby, so different to the first, to realise this. I also feel, now my eldest is at school, that he deserves some privacy. He’s going to be on the web in his own right soon and so I should leave him some space to make it his own. Thanks all who kept reading and subscribing and all the best for your future. Bub thinks he can do magic. He is obsessed with what might be hidden behind his ear. This is after his daddy amazed him by ‘finding’ all manner of things hidden there. Toys, money, even a cushion! Bub was astounded and delighted. He now asks me to check his ear often. He even says ‘abbradabbra’ six times (and makes me count along) to make the magic happen. I’ve told him only his daddy can do this magic but he still insists we try. He also thinks this is the answer to any statement that we don’t have enough money for X or Y. If we just check behind his ear we’ll have plenty and can if course buy him what he wants! So easy to get out of the habit of posting. But I love having old posts as a diary of my boys and I’d hate not to have anything of Baby’s second year. So here we go let’s keep trying. And I wanted to write about his new pig noises. Yup, my lovely 14 month old has just started to snort like a pig. He finds it very funny when we do it to him. And is very pleased with himself when he does it back. He can do a few other sounds. I hesitate to call them words because he doesn’t really use them in context but he can repeat them on demand so they are in conscious control. He says ‘da da da’ which is, of course, daddy. And ‘na na na’ which I’m claiming as mummy. He also says a sound which is like ‘there’ and used when he points at something. He can also shake his head for no. He doesn’t really use it to say no, instead preferring to fuss and shout loudly his displeasure. But he recognises that it means no and finds it funny to shake his head when you say no to him. And his final party trick, only mastered a few weeks ago, is to wave. Soo cute when you wave to him and he waves back. Honestly he just gets cuter by the day. And much more communicative than Bub was. He understands a few things and sometimes follows a simple command. It’s amazing how each day he seems to understand a little bit more and communicate a little bit more too. I wrote about two months ago about Baby’s impending operation. He has an undescended testicle and needed it investigating. This involved keyhole surgery under general anaesthetic. You might have wondered what happened. The original operation date was postponed, a day before it was due, because of ‘winter pressures’. But fortunately he wasn’t left waiting too long and had the operation about a fortnight ago. I had been dreading it. But it actually went remarkably smoothly. 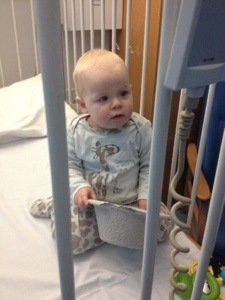 Baby couldn’t eat or drink for six hours before the op. But he napped through a fair bit of that time and the rest was spent with him being easily distracted by the excitement of being in a new place. Baby’s daddy took him to theatre and held him whilst they put him under. I think this shook him up but Baby took it all in his stride. An hour or so later and Baby was awake. At first he was rather unhappy and couldn’t hold down any milk. He projectile vomited all over himself and me which wasn’t great given I’d brought tons of clothes for him and none for me. But after a few cuddles, a bit more milk and some pain relief he got much better. I had thought pain relief would be a big issue but actually he was fine after that. I had Calpol and ibuprofen ready but we barely needed it. He slept a bit more than usual the next few days but otherwise has been grand. We came home that same afternoon. I have to say I was mightily relieved. Everything went so well and it was in large part due to the amazing nursing care we had – they and all the staff were so lovely. The Doctors say that we need to do this in two stages so we’ll be back at the hospital for a repeat procedure in about five months time. I can only hope it goes so well. Baby is nearly a year old. And suddenly he seems to begun to understand what we are saying. We play finding games all the time. We say ‘where is Bub?’, for instance, and he looks around and points. It’s really odd what we can understand and what he can’t. Ask him where Mia is, our cat, and he gets it every time. Ask him where mummy or daddy are and he hasn’t a clue. He’s very good with some toys – one baby doll called Tommy he loves and will happily search around for ages looking for him. He is also kind of speaking a bit too. He says ‘da da da’ all the time, though not in any context. But he does try to say the cat’s name. When he sees her he says ‘eee-a’ and does it so often it’s not a coincidence. This is all very exciting because his big brother Bub didn’t do much early talking or experiment with sounds. Argh! Time is flying, I keep thinking of things to blog but then don’t get around to doing it. The boys are getting bigger and better at everything. Bub is now four. Can you believe it? 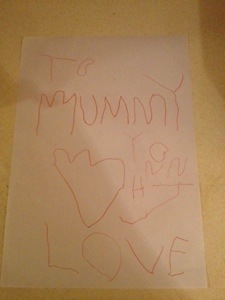 He’s suddenly got really into drawing and writing. 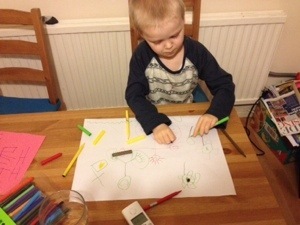 He does ‘stories’ in which he draws random letters and numbers on the page. And his pictures aren’t scribbles any more. His people have faces, bodies, legs, toes, even shoes. And big smiley faces! And Baby is nearly one. He’s started to pull up to standing all the time. 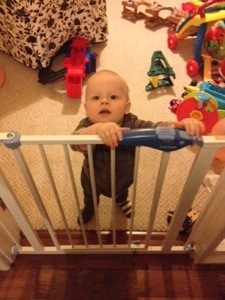 Though rather annoyingly for all concerned he doesn’t yet know how to get back down. So I kinda missed blogging about Christmas. This was disappointing as it was Baby’s first so I’d have loved to have written more. So here’s a quick note to record some highlights. Firstly, Bub’s ‘car cake’. A delicious concoction of icing and marzipan. He made it the same time his Daddy made a proper Christmas cake. Bub was so proud if it. He said he’s share it with his cousin on Christmas Day and showed it to everyone. I had to pretend I’d eaten it when it was finally time to throw out the final remains last week! 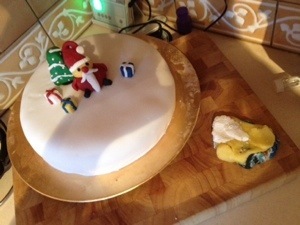 Secondly, the trauma which Father Christmas caused in our house. Bub decided that this Father Christmas bloke sounded kinda dodgy. Creeping into houses in the dead of night etc. No way did he want him here – he said he’d rather have no gifts at all. He was getting very anxious about it and his sleep really deteriorated in the days leading up to Christmas. In the end we agreed to leave the stockings in the shed so Father Christmas could go in there instead of coming in the house. This made Bub much happier, to the point where he even left out a drink and carrot for our guest. 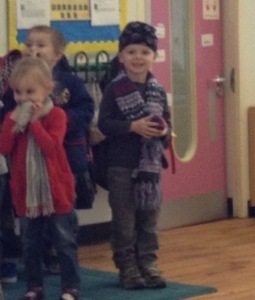 And then the nursery nativity play. Bub had the starring role (not!) as a percussionist. Given his lack of any musical ability and hatred of all singing I’m not especially surprised. I went along expecting him not to participate at all. But how wrong I was. After a few tears when being dropped off he soon got into the swing of it. I swear I even saw him singing too. 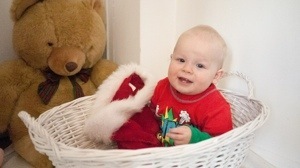 And what of my lovely Christmas Baby? Well he had a jolly good time despite a shocking cold. He didn’t even mind getting into the Christmas spirit by dressing as an elf in a seriously cheesy photo shoot with his baby friends! 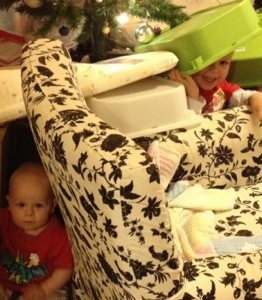 What is it with boys and dens? My three year old absolutely loves them. This usually means we end up spending the day with a third of the living room and half the cushions out of action as he builds up his latest den. Baby brother is just delighted when he gets to join in too. Goodness, how easy it is to get out of the blogging habit. I’d love to say it’s been because of me choosing to focus more on the boys before I go back to work. Or because my anti-marriage tax break campaigning has really kicked off. But, in all honesty, these would be untrue. It’s actually because I’ve rediscovered my love of all things crochet. Having not picked up my needles for over a year I’m now doing loads. 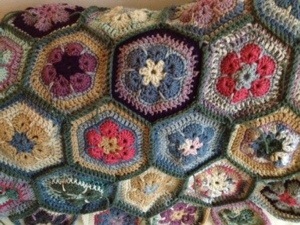 My current major project is this hexagonal blanket which is proving very satisfying to make up. Full disclosure – I’ve also been watching lots of Borgen in the evenings too! Life as a new mum, seen through a slightly sleep deprived prism. Currently trying to balance having a newborn alongside spending time with my gorgeous three year old son.